You are here : Home > News > NHL Team’s Alumni To Play In St. Petersburg And Moscow Against Putin? NHL Team’s Alumni To Play In St. Petersburg And Moscow Against Putin? Former players of Philadelphia Flyers led by legendary defenseman Jow Watson are visiting Russia to play three exhibitions in cities of Kazan (February 16), St. Petersburg (February 18) and Moscow (February 20). 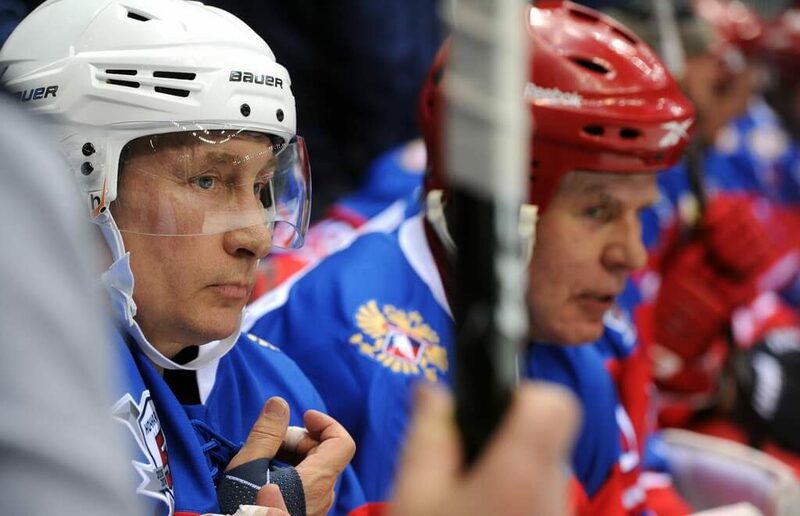 Rumours are constantly circulating that Russian President Vladimir Putin may come out on the ice too. The Flyers are reported to play three games within their tour with the game in St. Petersburg against the corporate team of the Gazprom Export Company, said KHL’s president Alexander Medvedev in an interview with Sovetskiy sport newspaper. He also noted that the game may take place at the Ledoviy Dvorets (The Ice Palace) where St. Petersburg’s SKA (the KHL’s defending champion) with Ilya Kovi Kovalchuk and Pavel Datsuk in roster play their home games. Joe Watson said in his interviews that the Flyers alumni would like to see Vladimir Putin in the roster of a rival team in the game planned to be held at the Red Square in Moscow on February 20. In Watson’s words, such a possibility exists, but Mr Putin’s schedule is known only for the nearest 24 hours due to security reasons, which is in fact only true to some degree. Mr Watson also said that Philadelphia Flyers is a big name in Russia as they managed to beat the CSKA team (called in American mass media as the Red Army team) in an exhibition in 1975 when the Soviets were on tour in the U.S. Regarding Putin’s possible participation, Alexander Medvedev only said that «it would be nice» without any further details. Interestingly, there is no any promotion of the Flyers’ arrival in Russia, only dedicated ice-hockey fans know it. In St. Petersburg, still no any advertising campaign is going on despite that just a few days are left. The Ledoviy dvorets is occupied on February 18 as the SKA play their home game, so the exhibition may take place before or after the SKA’s game, and that’s in any case not the prime time. And no matter what the time of the game is, visitors must know the show will take place which they now obviously don’t. Another big challenge for the exhibition is that the Phillies is not that big name in Russia as Mr Watson might assume. For example, other Pennsylvania team, the Pittsburgh Penguins, are more popular due to their success in the Stanley Cup 2016 and the names like Malkin, Crosby and Jagr which are well known in Russia let alone Mario Lemieux.